Do you have a drive full of photos and want to make something interesting with them? Or maybe you want to delight your friends with a pleasant surprise, make an original gift to your loved ones, or just enjoy more experimentation and creativity in your life? Try Artensoft Photo Mosaic Wizard! 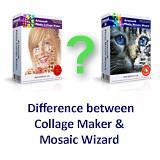 The program will help you to create a face photo mosaic in just a few steps. Faces always show our emotions: happiness, joy, surprise, pensiveness, being in love, the list goes on... It's always pleasant to look at photographs of faces! A photomosaic is a photo image made from a number of mini-images. After selecting a face for the source image, you can make a photomosaic of the face from photos of the same person. These don't have to be mini-images of the face only — you can use any conceivable photos of the person. As you include more photos for the mosaic, the photomosaic becomes more realistic and vivid. Unlike Photoshop, which can take some time to use, Artensoft Photo Mosaic Wizard does not require special skills or knowledge. You can even download the program for free to see its features — and the results — for yourself. Use the program to create photomosaics that are limited only by your imagination and creativity. Some attractive results include photomosaics with children's faces, couples, beaming parents and friends. So if you collect all of your photos of your child, and select one base photo to create the photomosaic, you can create a beautiful and bright photo mosaic of the face of your smiling kiddo. The smiling faces of newlyweds look good as well! Not to mention that a photomosaic makes a fine anniversary present for them. It’s guaranteed to make a pleasant gift for any occasion, because it's a present that you made yourself! Artensoft Photo Mosaic Wizard is fully featured, usable, and affordable photomosaic software, with a free evaluation version available for download.